By Air: Agra's Kheria Airport is located 11kms from Wyndham Grand, Agra and is approximately a 35 minutes’ drive. By Rail: The main railway station at Agra is the Agra Cantonment station. The journey takes approximately two hours from New Delhi by Shatabdi Express and three hours by Taj Express. There are direct trains from Mumbai, Kolkata and Chennai as well. The drive to the hotel takes approximately 20 minutes. By Road: The Delhi-Agra highway joins the two cities via Matura and is the best route for those wanting to drive to Agra. The drive of 190 kms takes approximately four hours. There are adequate number of refuelling stations and restaurants on the way. Take the Mehrauli - Badarpur road to reach Badarpur (23 kms from Delhi airport). At T point proceed right on National Highway 2 (NH2) for 190 kms to reach Agra after passing the historic temple city of Mathura (one hour before Agra). At the entrance OF Agra is Sikandra on the left, the tomb of the Great Mughal emperor Akbar. Proceed straight for 10 kms to the Waterworks crossing and turn right and after 3 kms turn left at Jeevan Mandi crossing. Proceed for 3 kms and turn right at the circle crossing while passing Agra fort, the beautiful residential palace of the Mughals on the right. Turn left immediately after 200 metres from T point. 3 kms ahead from Purani Mandi circle proceed straight and turn left after 1 km and take the Fatehabad road. Proceed for 4 kms on Fatehabad and cross the TDI mall on the let of the road .Wyndham Grand Agra is located on the right 400 metres ahead on the same road. Proceed straight from the gate for 600 metres and turn right from T point. Proceed for 1.2 kms and turn left from T point. After 1 km turn right from Idgah crossing, proceed straight for 500 metres and turn left from crossing. Proceed on Mall road for 5 kms and cross the TDI mall on the let of the road. 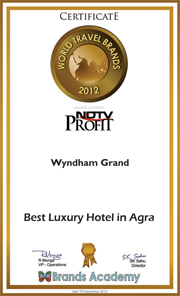 Wyndham Grand Agra is located on the right 400 metres ahead on the same road. Proceed on National Highway 11(NH11) after Ghat gate for 240 kms to Agra passing the towns of Dosa and Bharatpur. Bharatpur has one of the finest bird sanctuaries in the world, Keoladeo Ghana national park that is home to more than 300 species of birds. 25 kms further towards Agra, on the right, is the deserted city of Fatehpur Sikri which is a UNESCO World Heritage site. Proceed straight on NH11 for 38 kms and turn left immediately after Shahganj railway crossing. After 1.5 kms turn right and proceed for 2 km and turn right again from T point. Proceed straight for 1 km and turn left from T point and right from circle 100 metres after. Proceed for 1.5 kms and turn right from Panchkuia crossing onto Mahatma Gandhi road. After 2 kms turn left from Avantibai crossing passing statue of Rani Avantibai on a horse. Proceed for 5 kms and cross the TDI mall on the let of the road .Wyndham Grand Agra is located on the right 400 metres ahead on the same road.